Taman Nasional Bukit Tigapuluh is a hilly region in the middle of the expanse lowland at the eastern part of Sumatra, and it has high potential diversity of plants and endemic animals. 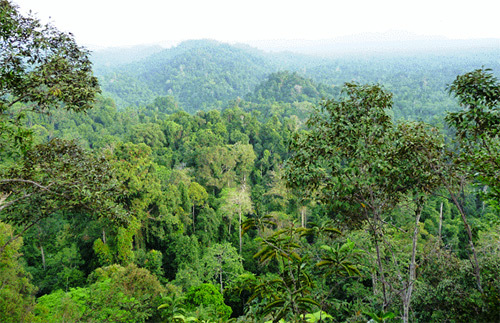 The ecosystem types constituent forest at Bukit Tigapuluh National Park is lowland forest, pamah forest and upland forest with the kind of flora like jelutung (Dyera costulata), red gum (Palaquium spp. ), Pulai (Alstonia scholaris), kempas (Koompassia excelsa), tassel (Shorea spp. ), fungi face Rimau / rafflesia (Rafflesia hasseltii), dragon's blood palm or jernang (Daemonorops draco), and various types of rattan. Moreover, Bukit Tigapuluh National Park has 59 species of mammals, 6 species of primates, 151 species of birds, 18 species of bats, and various species of butterfly. World Wildlife Fun or WWF set up the camera traps in this Bukit Barisan National Park since March and April 2011, and have taken images of 12 rare Sumatran tigers, including a mother playing with cubs. In November 2011, the WWF has announced 5 endangered cats in the forests of Riau. Within 3 months of systematic survey using automatic surveillance cameras at the 'corridor' between the Bukit Tigapuluh National Park and Rimbang Baling Sanctuary, they found Sumatran tiger (Panthera tigris sumatrae), Sunda clouded leopard (Neofelis diardi), marbled cat (Pardofelis marmoata), golden cat (Catopurna temmincki, and leopard cat (Prionailurus bengalensis). The cats passing the same tracks all the time in the corridor, but both areas connected by corridor are currently threatened by deforestation. Besides the habitat of the Sumatran tiger (Panthera tigris sumatrae), the tapir (Tapirus indicus), agile gibbon (Hylobates agilis), bears (Helarctos malayanus malayanus), blue pheasants (Lophura ignita), kuau (Argusianus argus argus) and others are settled in this park. Initially, the area in this national park is a protected forest and limited production forest. However, the condition of the forest park is relatively unspoiled. The communities around Bukit Tigapuluh National Park consists of several parts with customs and culture that relatively still very genuine, like Suku Anak Dalam, Talang Mamak tribe and others. According to the community, particularly Talang Mamak tribe, they believe that the hills and plants in this national park has a magical power in their lives. Indirectly they actively participate in maintaining and protecting the hill or plants in this place.